The Shakespeare Rolling Barrel Swivels are incredibly strong and reliable; perfect for use on rigs for your fresh or saltwater angling. These swivels are made from top quality components and are perfect for helping stop your line becoming tangled and twisted on your rig. Each swivel is strong and durable and can be used for a variety of fishing applications such as sea, predator, coarse and game fishing. 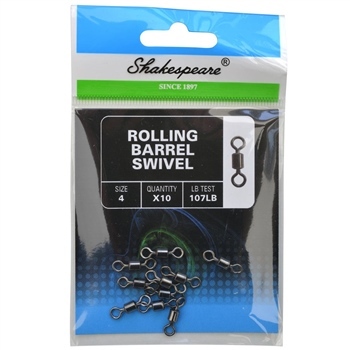 The Shakespeare Rolling Barrel Swivels are supplied with 10 in a pack and you can select your size from our drop down menu.